Jason Kravitz (Brussels, Belgium) on 8 October 2008 in People & Portrait. This metallic guitar is incredible ! seen well, this framing ! Jason, I love the reflective property of this guitar! 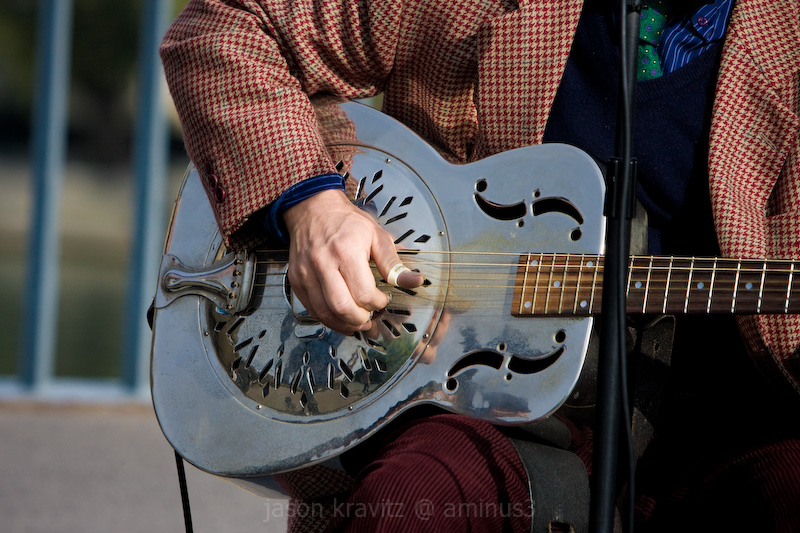 An even with out seeing his face, we can tell a lot about the musician by his mixed pattern garb! Great portrait! I like this picture ! greats ! I can almost heat the music! Great capture! Jason - this is a fabulous photo. Time for me to go and listen to some of the professionals live again. His guitar looks so well used and very special - I'm sure it sounded great. Wonderful shot, Jason! Absolutely love the way the guitar face picks up almost nothing but the blue sky. Thanks for sharing!